The Qin Dynasty of China will always be remembered for introducing the infamous Terracotta Army to the world. 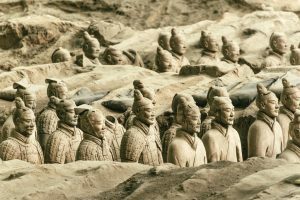 This Terracotta Army, a multi figurine military art form was designed to protect the Dynasty’s Emperor in the afterlife. Obsessed with immortality, the Emperor, Qin Shihuang, had grand plans for a mausoleum to maintain his power in the afterlife. This amazing structure was created by as many as 700,000 workers and the Emperor was buried with nearly 8000 terracotta warriors as his bodyguards. When workers were digging a well outside the city of Xi’an, China, in 1974, they happened to strike upon a life-sized figure of a terracotta soldier. A team of archaeologists then uncovered thousands of soldiers, buried alongside the First Emperor. Lining the corridors of three burial pits, in order of rank, they were also accompanied by chariots, horses and weapons. They are one of the most spectacular archaeological discoveries ever made and continue to arouse interest and speculation. Although Qin’s tomb itself is unexcavated, The first Emperor artefacts continue to raise questions. In 1999, a further excavation revealed the figures of half naked men within the area. The question of why these would be there remains a heavily debated subject amongst Historians. The Qin Dynasty did not actually last very long but is also renowned for its impressive architecture and art. Emperor Qin abolished the rights of landowners and introduced many huge architectural projects during his reign. 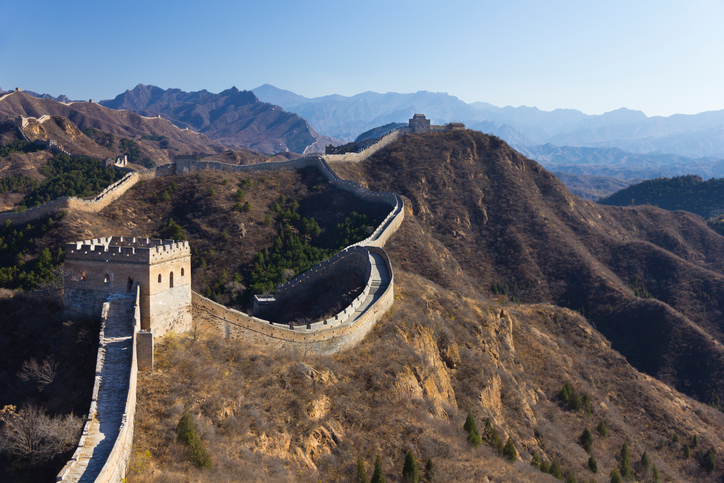 This access to a massive workforce allowed the construction of the first part of the Great Wall of China. He also built a huge road system and standardised the Chinese writing system. Chinese people believed that their culture was divine and this inspired beautiful artwork and exquisitely crafted items, from ceramics and textiles to jade burial suits. Today, Museums are full of sculptures, calligraphy, metalwork and paintings. Highly collectable, these art forms spread across East Asia and remain highly sought after. You can find out more by visiting Barnebys for examples of art from this infamous era.